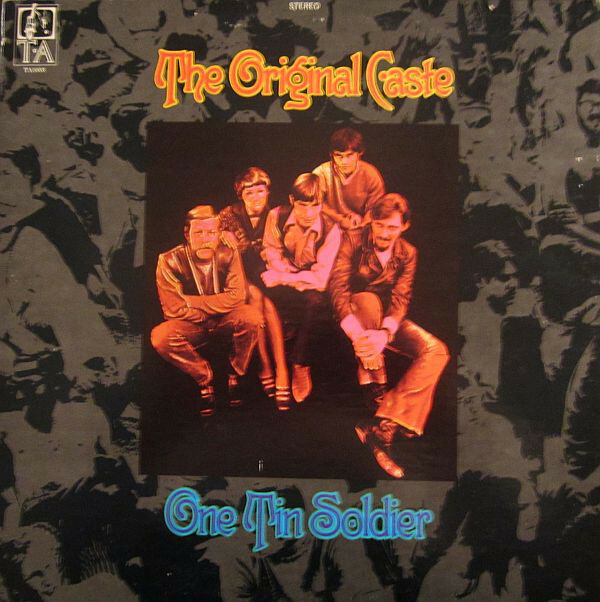 Before the Billy Jack movie ever existed, the Original Caste reached the US Top 40 with "One Tin Soldier." After the early Dennis Lambert-Brian Potter composition with a "peace on earth" moral had run its course for them, though, the Calgary band could only manage to get three more songs to "bubble under" in 1970. The group who had been called the North Country Singers until 1968 would ultimately prove to have more traction in its homeland of Canada and in Japan. After their flurry of early '70s success, the Original Caste managed to reconfigure off and on throughout the following decades under the ongoing leadership of Bruce Innes (who split up with his lead vocalist wife Dixie Lee in 1980). He's remained musically active since the sixties into the 2010s, having sung backup on the hit recording of John Denver's "Rocky Mountain High" along the way. 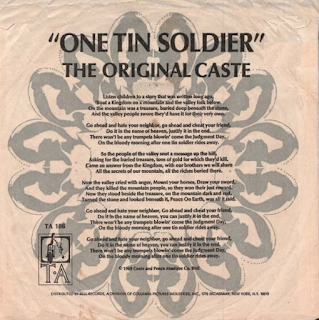 Here are the Original Caste's four Billboard singles, including "One Tin Soldier, which entered the US charts in late 1969 but peaked in early 1970. 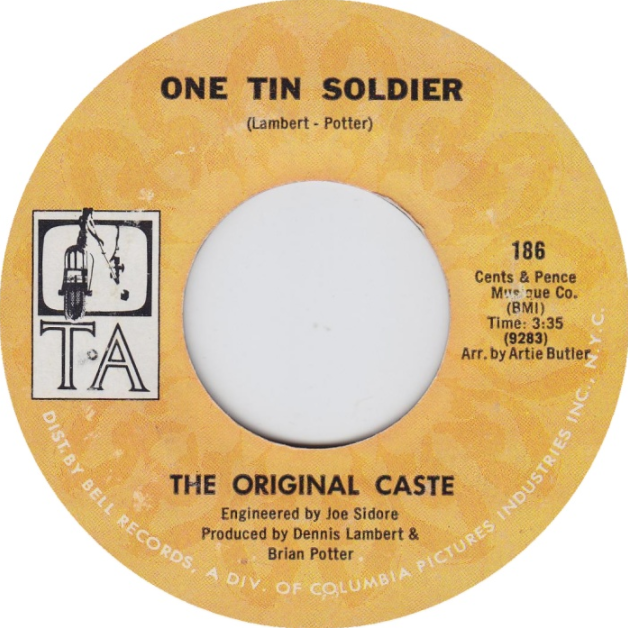 After signing to Bell subsidiary label TA, the Original Caste released this single written by their producers Dennis Lambert and Brian Potter. Guitarist Bruce Innes reports not having any inkling that the song had actual hit potential until Chicago's WLS put it in hourly rotation. 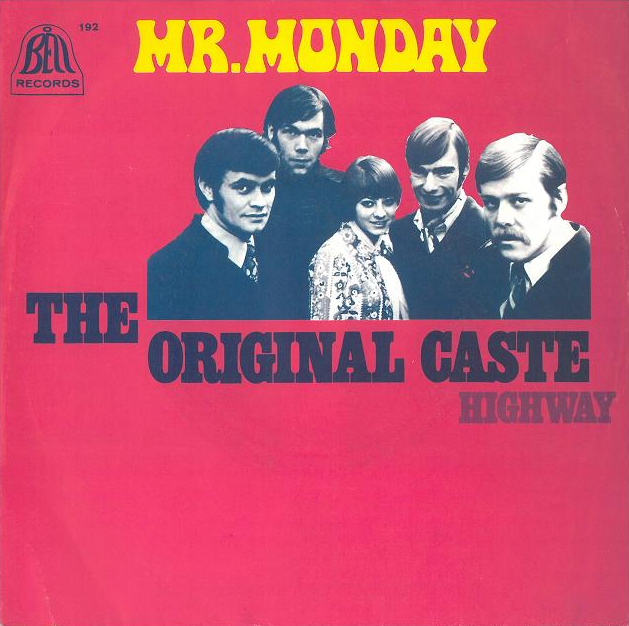 It seems strange that Billy Jack film composer Mundell Lowe opted to record a new version of a recent hit rather than licensing this one, but maybe the now-legendary shoestring budget of the film (one million dollars) demanded it. There was also the problem of TA/Bell Records being a division of Columbia Pictures, while Billy Jack was a project for Warner Bros., its competitor. 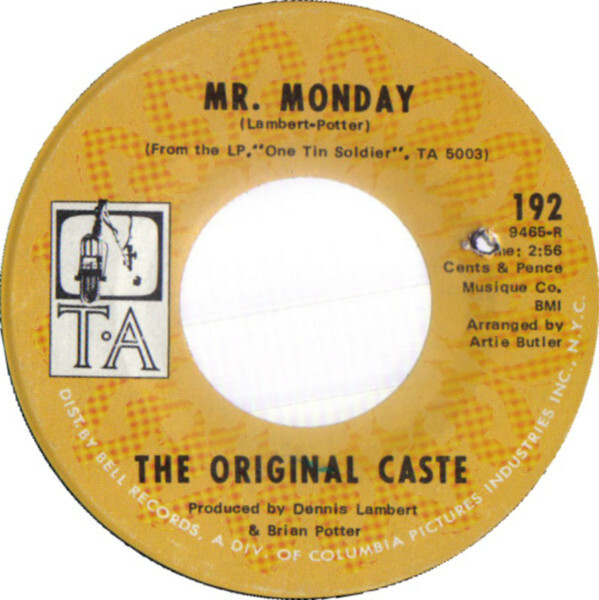 All of the Original Caste's US charting singles were Lambert-Potter compositions. "Nothing Can Touch Me" focused on the power of imagination (or some other unnamed power) to help you "sit and get high" when the "pressures of the day" get too heavy. In Canada, though, the flipside is the one radio stations spun and sent to #29 in RPM Weekly (Canada's chart authority until 2000). Written and sung by Bruce Innes, "Country Song" is a Class A hippie social-crit anthem with weird and wise lyrics every bit as subversive—if not more so—than "One Toke Over the Line" or "Signs." Innes, channeling the melody and structure of "The Weight" by his countrymen the Band, sings of interactions with a warmongering "unknown soldier," cops "mowing down" kids for "passing their stuff around," and the "beer cans and swill" in public waters. There's no question this song inspired Five Man Electrical Band's Les Emmerson (from Ottawa) with its mood and attitude to write "Signs." Where Innes sings "I took off my boot and did a salute," Emmerson sings "I took off my hat and said 'Imagine that!" And the money line in the "Country Song" chorus is one every Canadian child of the seventies knows: "My neighbor Fred said God is dead, but I think he just moved away." US radio listeners definitely lost out on this one. 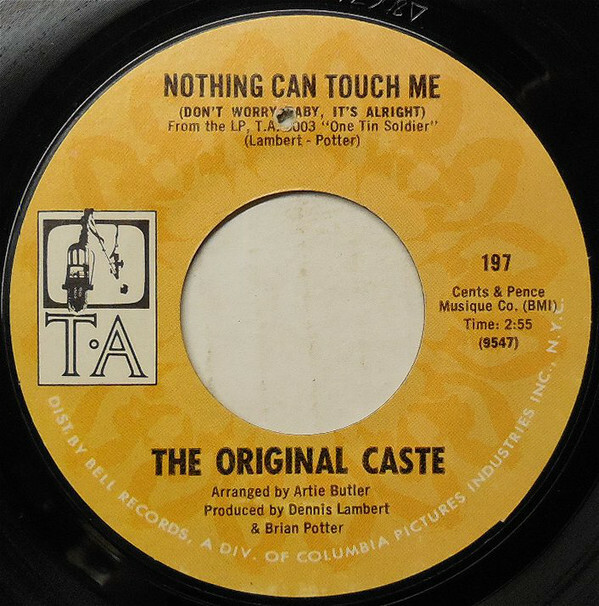 Side A: "Nothing Can Touch Me (Don't Worry Baby, It's Alright)"
Lambert and Potter's "Ain't That Tellin' You People" had a "whole world needs some changin'" chorus that walked in step with the Five Stairsteps' "O-o-h Child" or the Brotherhood of Man's "United We Stand" (both from earlier in the year), and it did especially well on Canadian MOR stations, peaking at #2 on RPM Weekly's "MOR Playlist" chart. It becomes clear, when listening to the Original Caste's singles, though, that all the songs Bruce Innes wrote are especially worth paying attention to. His B-side "Sweet Chicago," a youth movement think piece about recent Chicago violence (e.g., the 1968 Democratic Convention) and gun control in general, taps into the pensive musical atmosphere of Brook Benton's "Rainy Night in Georgia," a late 1969/early 1970 hit. Which came first? 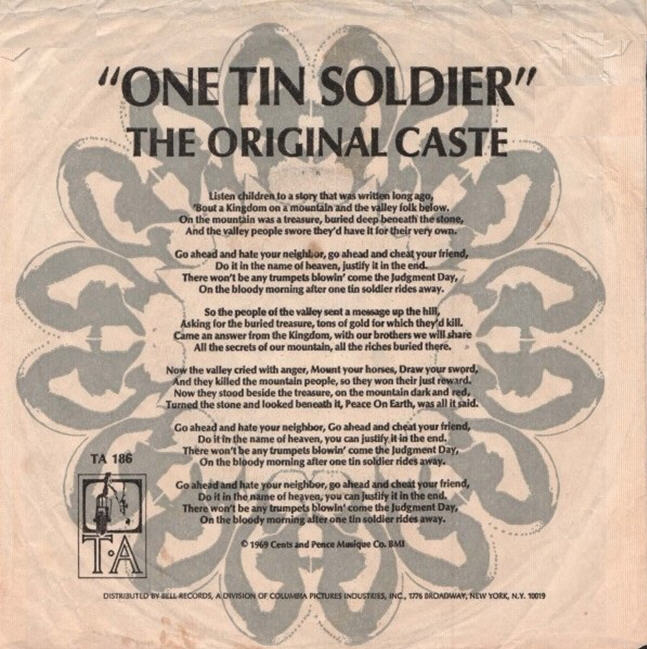 Although the "One Tin Soldier" single came out in late '69, I'm pretty sure its album, which also included "Sweet Chicago," didn't roll out until spring 1970 or so. 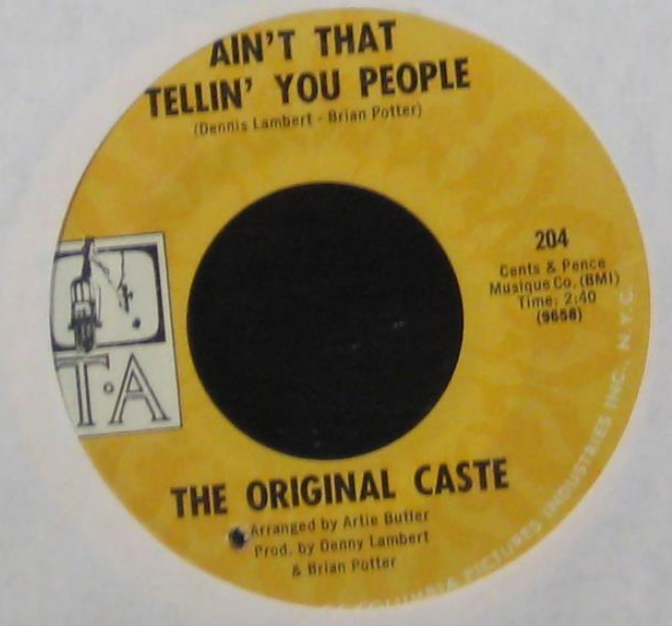 Side A: "Ain't That Tellin' You People"
By 1971, Dennis Lambert, Brian Potter, and arranger Artie Butler had parted ways with the Original Caste and, shortly before the TA subsidiary of Bell would shut down altogether, the group released one more single. This time around, it was Roger Nichols, the songwriting partner of Paul Williams, who sat in the producer's chair. And although an ad appeared in the March 20, 1971 issue of RPM Weekly clearly designating the Williams-Nichols composition "When Love Is Near" as the proper A side, the following week's issue showed the B side listed on the RPM 100, the Country 50 and the MOR Playlist charts. In that same issue, a young Terry David Mulligan plugged the song in a column and the magazine's singles review section panned the intended A side with a "WHO CARES??????" while praising "Sault Ste. Marie" as the "big side" and declaring it to be "about time the very talented and highly creative leader of this Canadian group received some recognition." And they were right about "Sault Ste. 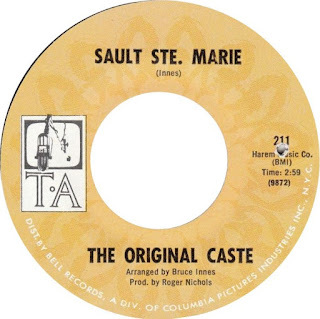 Marie," a rockin' Canada-centric road song with another classic line in the chorus: "I'm just trying to make it to Montreal / I do believe I'm going to hell." In truth, they were on their way to Japan for some touring, then into the studio, eventually, for a 1974 album on the Century II label, but no more rides up any pop charts.